So you found your mister but you still need your (soul) sisters! Congratulations! He popped the question and now it’s your turn to propose to the special girls in your life! What better way to propose to your bridesmaids than with their very own signature cocktail?! 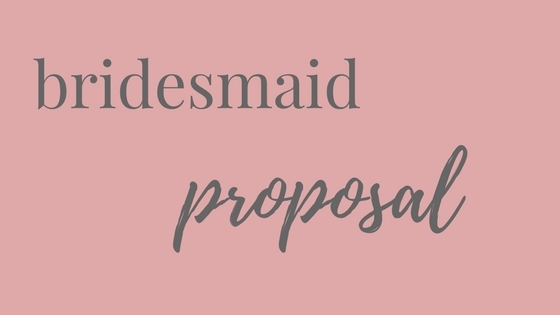 This one of a kind bridesmaid proposal can be put together with little time to spare, minimal effort + for under $30! I know, I know…does it get any better?! This sweet surprise will promise an unforgettable moment for you and your girlies! We found our baskets + crinkle filler paper + ribbon at the Dollar Store for a whopping $1 each! This comes out to $2 a basket. These perfect Elderflower Rose Lemonades can be found at most specialty grocery stores! We found ours at Fresh Market for $2.50 each! We couldn’t wait add these playful straws to the mix! They can be found at most party stores and we found ours at Target. A box will provide you with more than you will need and only cost you $3. Just use your ribbon to tie them securely to your lemonade bottle. While we were at Fresh Market we grabbed some organic lemons + sugar cubes to add zeal to this cocktail! The lemon will bring bright flavor and the sugar cubes will keep things sweet + bubbly! The organic lemons rang up at $1 each and a package of 125 sugar cubes was just about $5. We had these amazing teeny tiny glass jars on hand from a Hobby Lobby haul that rang up at $1 each. They make the perfect cozy home for your sugar cubes! We added our favorite bottle opener to the basket because, you know, every smart girl should be prepared…for cocktail time! These were found on sale at Anthropology for a simple $5! Now, for the most important part! At Bells Box we believe that no cocktail is complete without the bubbly! Feel free to choose whatever brand your future bridesmaids like best but keep in mind our one suggestion…make it pink! You can go for a full sized bottle like we have or you can go for a cute mini bottle! A smaller bottle will balance well with your mini lemonade but a full bottle is always fun and indulgent! This comes out to $28.29 per basket! To really top this off, write out the recipe for each girls’ signature cocktail on a fun piece of paper. You can trace a square or circle around the recipe and cut out carefully. Add this to the basket or use a piece of ribbon to tie it to your basket. Don’t forget to name the cocktail! 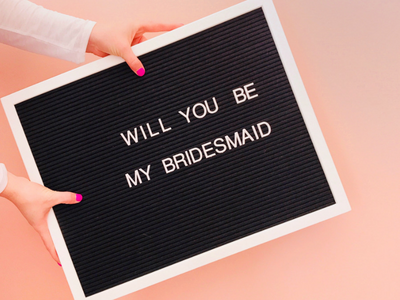 We suggest using a cute phrase that includes your Bridesmaid’s name so that it feels sweet and personalized. For example: The Sparkling Sophie, The Bright + Bubbly Kelly, etc. We hope that this tutorial helps you and provides your bridesmaids with a moment they will cherish! If you create your own Signature Cocktail Bridesmaid Proposal be sure to share your pictures and reactions with us!